From the game developer conference through game art, woman power in the games/tech sector, and eSports to the Gamefest for the whole family. Berlin, GERMAN ESPORTS SUMMIT and Gamefest as well as the nine other events of gamesweekberlin 2019. Games today are no longer just a medium for young people, but also a cultural and educational medium, a driver of innovation and form of therapy as well as sport. According to game – German Games Industry Association, this diversity becomes apparent at gamesweekberlin and also helps to ensure that games are being used in all age groups. The German games market, which increased again significantly in 2018 by 9 percent to around 4.4 billion euros, is also benefiting from this dynamism. Michael Müller, Governing Mayor of Berlin: "Over the past decade, Berlin has developed into a leading hub for the computer games industry in Germany. With around 200 games companies, an outstanding infrastructure, central associations, strong support and excellent training opportunities, Berlin's games industry presents itself as a lively and diverse hub. New technologies such as VR and AR make a major contribution to this. Berlin is also positioning itself as an internationally relevant hub in the field of eSports, one of the fastest growing fields of exploitation in the sector. I wish all those attending gamesweekberlin interesting events, good networking, successful business and a productive time in Berlin". Michael Liebe, CEO Booster Space & Head of gamesweekberlin: "Seven days, 17 events under one roof! The commitment of the numerous partners and organisers shows that the concept meets the need to bring games culture, business and technology closer together. It also shows that Berlin presents an attractive location for a multitude of diverse target groups. Probably the most important trend in the games industry underscores this development: computer games are an increasingly important topic across the generations, genders and nations. We are looking forward to the biggest gamesweekberlin of all time! Kulturbrauerei (Schönhauser Allee 36, Berlin)\u2028Europe's oldest game developers conference is getting a make-over following the brand's takeover by the Berlin company Booster Space. Discussions and presentations will take place at eight summits in concentrated keynotes, talks, roundtables and workshops over two days. Topics such as marketing, live ops, community management, financing and funding of games as well as current developer trends for PCs and mobile devices, innovative technologies and the use of computer games in the health service will be intensively discussed in these concentrated sessions. International and national speakers such as the actress and motion capture performer Nina Franoszek and Jens Matthies of Machine Games ("How to Capture a Villain - Character Building with Motion Capture"), Laura Higgins of Roblox ("Civility By Design: Fostering a Community of Confident, Creative and Compassionate Digital Natives"), Lance James of Versus Evil ("Learning to Communicate"), Marc Kamps of Birds & Trees ("Extensive - expensive: Things to Pay Attention to While Developing Evidence-based Apps in the Field of Transition Medicine"), Are Mack Growen of London Venture Partners ("Funding the Dream"), Rafael Miranda of Amazon Alexa ("Alexa, Press Start. - Gaming's Newest Frontier"), Alexander Satanowsky of Daimler AG ("The Unknown Gamer: Attracting New User Groups and Investors"), Nicole Schlautmann of Pfizer ("The Role of Pharma in Digital Patient Support"), Dr. Markus Schlobohm of Techniker Krankenkasse ("Digital Health and Games"), Daniel Stammler of Kolibri Games ("Start Lean, Learn Fast, Scale Faster - How a Small Idle Game Became an International Smash Hit"), Mark Vallee of Microsoft Azure | Playfab ("Designing for Growth with Live Game Operations"), Alexander Willink of Voodoo ("Hypercasual - Creating Successful Games for a Casual Audience"), Eric Zimmerman of New York University ("My Way of Games Education") and many more are being lined up for this year's QUO VADIS. The artistic-scientific research conference on computer games, "Clash of Realities", will be discussing the global state of digital games in higher education at its own summit for the first time during QUO VADIS. QUO VADIS is supported by Medienboard Berlin-Brandenburg. Womenize! Games and Tech, 10 April, 10 a.m. – 6 p.m.
Kulturbrauerei (Schönhauser Allee 36, Berlin)\u2028This is now the fifth time that Womenize! will be focusing on everything to do with careers, prospects and empowering of women in the games and tech sector. In addition to the lectures and panel discussions, this year will also see workshops being organised for HR specialists for the first time, including one with the HR experts Aleksandra Zdeb and Tomas Jensen of Wooga ("Fostering Diversity in the Game Industry – A case study") and a talent workshop with Kate Edwards of Geogrify ("Don't Think You Are, Know You Are - Embracing Your Talents"), a "Portfolio Workshop" with the level designer Klemens Reckfort of Jo-Mei and the concept artist Sara Han ("Polish and Optimize Your Portfolio") and a workshop with the consultant Ruth Lemmen ("Networking and Self Management"). Speakers include Carolin Wendt of CD Projekt RED ("Building Bridges & Putting Out Fires: Community Management in Games"), Rachel Quirico (Event Host Cyber Solution Agency), Rae Grimm (Head of GamePro.de) and Martine Spaans (Founder Tamalaki). Womenize! Games and Tech is supported by Medienboard Berlin-Brandenburg. GERMAN ESPORTS SUMMIT 2019, 11 April, 9.30 a.m. – 9 p.m.
Kulturbrauerei (Schönhauser Allee 36, Berlin)\u2028The gamesweekberlin will become the centre of European eSports. The GERMAN ESPORTS SUMMIT (GES), the symposium of the German Esports Federation (ESBD) with about 200 participants, will take place under the banner of "The Esports Movement". With over 30 speakers and more than 16 talks, panels and workshops, the Summit is the largest socio-political eSports conference in Germany and is set to have speakers attending from all over the world. Apart from an extensive proramme of lectures and panels, the GES will be offering a number of practical workshops. The programme offers the opportunity to learn from leading experts from the areas of eSports, sport, law and business - and take the socio-political discussions to the next level. The speakers will include Britta Dassler (FDP), Natalie Denk (PICAPIPE), Maxi Gräff (Microsoft), Lars Klingbeil (SPD), Christian Lenz (BIG - Berlin International Gaming), Kalie Moore (The Story Mob), Rachel "Seltzer" Quirico (CSA), Timo Schädler (Special Olympics Germany), Maren Schulz (game), Margit Stumpp (Bündnis 90/Die Grünen), Lorenzo von Petersdorff (USK) and many more. This year will see an extensive pre-conference programme being organised by the ESBD for the first time. Two internal working sessions will be held the day before: women from the eSport movement will meet and get to know one another in a Networking Breakfast in order to develop common positions and structures. Later on, the ESBD will bring around 15 national eSports associations together in the "European Esports Meeting Berlin" to discuss the future of European integration. The GERMAN ESPORTS SUMMIT is supported by Medienboard Berlin-Brandenburg. A MAZE./Berlin festival. The festival focuses on the art and culture of games and presents a unique, games and playful media exhibition, inspiring talks and workshops as well as a public evening program with performances, live music and DJs in a new location, the SEZ in Berlin-Friedrichshain. For the eigth time theA MAZE. Awards will be awarded in seven categories. 181 projects from 32 countries have been submitted, 25 games are nominated. Numerous indie game developers from 40 countries will speak at the talks and workshops, including Simona Maiorano (Italy), Eric Zimmerman (USA), Peter Lee (South Korea), Niki Smit (NL), Nicole He (USA), Sun Park (South Korea), Mx. Dietrich Squinkifer (Canada) or Gwen Foster (Philippines). The Mega Game and ENTER AFRICA project of the Goethe-Institut with participants from 15 African countries will premiere here. In addition to the exhibition, which is open daily until 1 a.m., the evening will be packed with musical highlights and playful formats celebrating the artistic subculture of video games, including with h-e-x-o-r-c-i-s-m-o-s, Bad Stream, Johannes Knop, Debmaster, Siren's Carcass, DJ Scotch Egg, T-Raumschmiere, Dj Belec, VJ: Petula Black Sperm, DJ Storno, and many more. A MAZE./ Berlin is supported by Medienboard Berlin-Brandenburg. Gamefest 2019 invites families and gamers to play and let off steam in an area of over 600m². Special guests on Friday evening are Berlin's Governing Mayor Michael Müller, who will welcome the Gamefest's visitors, and the Mayor of Helsinki Jan Vapaavuori. An interactive exhibition promises gaming fun with indie titles, board games, VR adventures, arcade and retro consoles as well as the Indie Arena Booth. Attractive prizes will be beckoning again as part of a tricky Real-Life Quest. The programme on stage includes interviews, live Let's Play, tournaments, signing sessions and live music, including the violinist Georg Marth, who will be playing games music. The Youtuber Saftiges Gnu and Mikkel Robrahn & Dennis Brammen of PietSmiet (reading: "Viggo: A PietSmiet Story") are also expected to attend. On Sunday, the visitors can expect a tournament of the car racing game Wreckfest by THQ Nordic as well as a fan meeting of the Polish studio CD Projekt RED, the developer of the legendary RPGs "The Witcher" and "Cyberpunk 2077". Workshops about career opportunities in the games industry and media skills as well as workshops for cosplay beginners will be held in cooperation with the Games Academy and the allyance Youtube network: "New on Youtube - How Do I Start? ", "Game development - Hands-On. A Do-it-Yourself Look Behind the Scenes of Developing Computer Games", "It's Loki Cosplay. From the First Idea to Your Own Costume" and more. 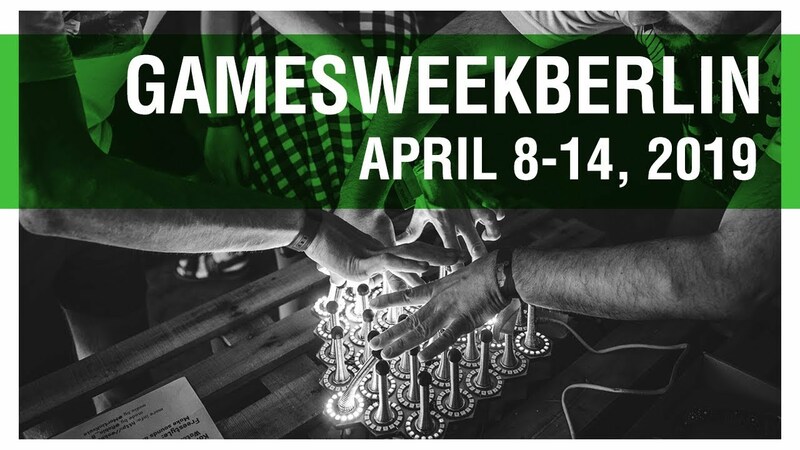 The Gamefest is supported by Medienboard Berlin-Brandenburg. Cosplayers are admitted at a reduced rate. On 11 April, on the evening before the Gamefest, gaming experts have the possibility to show their knowledge at the Seitenquiz in the Alte Kantine of the Kulturbrauerei. Twitch Developer Tour, 12 April, 5.30 p.m. – 9 p.m., betahaus(Rudi-Dutschke-Str. 23). GameOn – Best of Games IV, 10 April, 3 p.m. – 11 p.m., GameOn Berlin (Toeplerstr. 37, Berlin), tickets:15€. Around 700 invited guests are expected to attend the awards ceremony for the 11th German Computer Games Awards (DCP). The best games of the year compete in 14 categories for prize-money totalling 590,000 Euros. The gala is moderated by Ina Müller and broadcast on www.deutscher-computerspielpreis.de. The awards are organised by the Federal Government – represented by the Minister of State for Digitalisation and the Federal Ministry of Transport and Digital Infrastructure (BMVI) – as well as game – the Association of German Games Industry. The event is funded by Medienboard Berlin-Brandenburg. TwitchCon in Berlin is the first convention of the US streaming service to be staged outside of the USA. The mega-event will open with a keynote by the Twitch CEO and co-founder Emmet Shear.